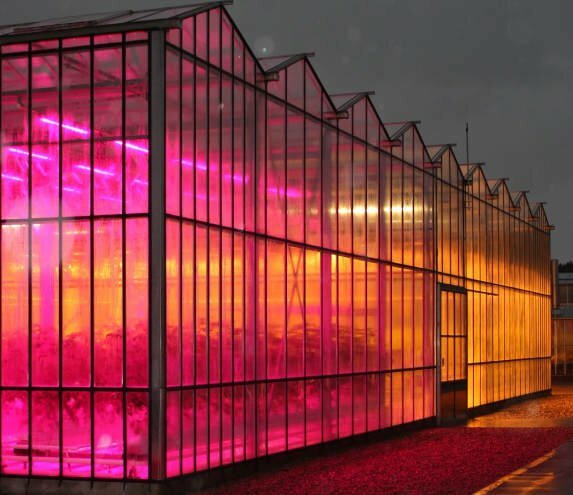 UK plant researchers are looking into LED lighting to grow plants with less energy. While outdoors in the summer there is no real need to provide plants with artificial lighting, it is increasingly used to extend the growing day and growing season inside greenhouses. It is not necessarily the efficacy of LEDs that is the advantage, as the high-pressure sodium (HPS) lamps currently used can deliver up to 150 lm/W, but the ability save power by only delivering wavelengths useful to plants – green, for example, reflects off plants. Strockbridge Technology Centre (STC) is a plant growing research lab in Yorkshire. “The most efficient way to drive photo synthesis is red light. You need a small amount of blue and in some situations you need far-red light,” STC science director Dr Martin McPherson told Electronics Weekly. STC is one of many horticultural research establishments around the world trying to work out exactly what spectrum is needed when for what plants in what situation. Philips, owner of LED firm Lumileds, makes a range of LED-based growing lamps, branded GreenPower, and is honing its products based on feedback from plant research customers. The latest GreenPower product puts out 50µmol (see below) of useful light from 23W of electricity. “Its predecessor used 32W, and it still produces the same 50µmol output,” said Philips. Its grown lamps now come in seven different spectrum options. “With these we offer the best combinations of spectrum, intensity, moment of lighting, uniformity and positioning to steer specific plant characteristics such as compactness, colour intensity and branch development,” said the firm. One of its recent introductions, dubbed Far Red, is optimised to promote flower formation and rooting, and includes some white light for people working around the plants. So, how good is LED plant lighting? McPherson says it is early days. He is certain it will be popular, but the jury is still out on how effective it will be, which lights will win in which situations and when the commercial tipping point will be. Information from lighting manufacturers, he said, suggests growers are seeing 30-60% energy savings over HPS illumination and are expecting more as the technology improves.